One day, I took two hot pink skeleton figures and set them on pumpkins to take some pictures. They were sitting just right and then I backed up to take the picture. One of the skeletons fell sideways and his mouth fell open just as I clicked. It looked so much like he was laughing to something the other one had said that it became the photo I liked the best. After taking a lot of pictures with the two skeletons which my granddaughters named Skeltie, they sat in my computer, then on disk for several months. A few days ago, looking for something else, I noticed them again and decided to put this one into photoshop to see what I could do with it. I’m not very good at photoshop and I decided to try painting over all the edges in blue and then removing everything else. My hands have a fine jerk as I use the mouse or even when using a real paintbrush on a canvas which resulted in wiggly variable lines around the skeletons in the photo. But I did it anyway. After getting the figures outlined and outlining some of the “punkins”, I removed the background elements and put the figures through a filter to make it look like chrome. With the two skeletons interacting with each other sitting on the pumpkins, the chrome effect from my lines expressed their laughter perfectly. This artwork (on the tshirt below) was the result and seems like the Skelties are having a talk with something said that was funny enough to send one of them falling over with his mouth open in laughter. 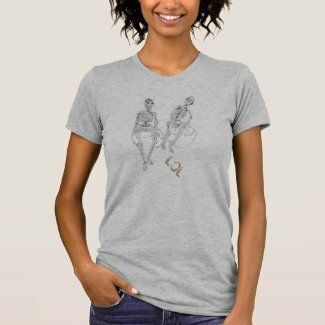 So, as I went to put them on products at my store on zazzle, LOL popped in my head as the perfect thing to describe the interaction. It is probably twisted but seemed right and there you go. I’m thinking of taking this design and enlarging it on the tshirt to show only the top half of the skeletons laughing with the LOL in the corner as a second version. So far, I’ve made a hundred products with the design on it that didn’t work last night because the quick create function crashed right in the middle of going one product at a time and placing them properly. It means that each product will have to be made individually instead. 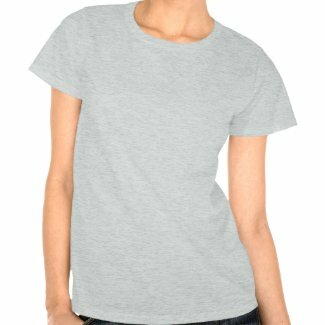 Before doing that, I had made several ipad cases separately with the design and playing cards, then today made three tshirts with it. I like them. 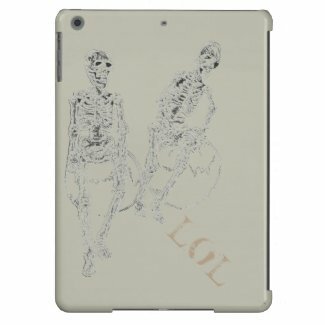 My favorite so far, is the ipad case in grey with the figures of the Skeltie skeletons barely showing and the LOL diagonally in a tan color on one corner. Let me go see what I can do with it. Need to make a shopping bag and some pillows. Brilliant – that was so fun! I laugh everytime I see them.